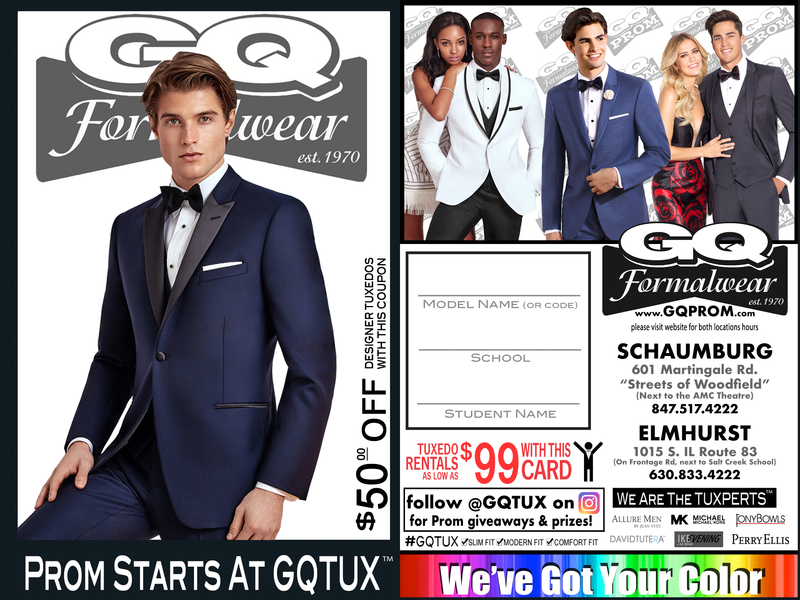 GQ Tux has you colored for #Prom2019! With over 10,000 color and style combinations, GQ is your destination for the hottest in today’s fashion. Proudly serving over 50 high schools for the last 49 years! York, Fenwick, Immaculate Conception, Montini, Glenbard West, Glenbard East, Glenbard North, Glenbard South, Maine West, Maine South, Riverside Brookfield, Hinsdale Central, Hinsdale South, Elgin, South Elgin, St. Edwards, Streamwood, Schaumburg, St. Francis, Westmont, Timothy Christian, Lyons Township, Fenton, Nazareth, O.P.R.F., Palatine, Stevenson, Addison Trail, St. Viator, Willowbrook, Barrington, Bartlett, Lake Park, Walther Lutheran, Buffalo Grove, Conant, Elk Grove, Hersey, Prospect, Fremd, Rolling Meadows, Wheeling, Hoffman Estates, St. Joe’s, Proviso West, Proviso East, P.M.S.A. and the list continues to grow!